Hirofumi Kitazume, was born in Yokohama, Japan and attended the Nowa Ballet School in Kanagawa since 2001 and in 2008 he attended the Central School of Ballet in London where he graduated. 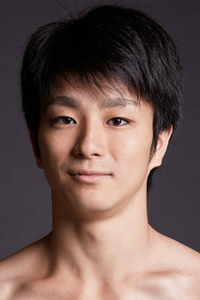 He joined the Kumakawa Ballet Company in 2009 and danced several soloist roles in the productions of The Sleeping Beauty, Swan Lake, Tales of Beatrix Potter, Cinderella and Romeo and Juliet. In 2012 he relocated to the US to join Atlantic City Ballet and Arts Ballet Theatre of Florida where he performed principal roles in The Nutcracker, Dracula, Le Spectre de la Rose, Petrouchka and Carmen. Hirofumi has been awarded medals in ballet competitions in Tokyo and Nagoya. In the summer of 2017, Hirofumi competed in the International Ballet Competition Moscow and was a semifinalist in the men’s senior competition receiving a diploma. At Eugene Ballet, Hirofumi was featured as Prince Albrecht in Giselle, the Cavalier in The Nutcracker, Oberon in A Midsummer Night’s Dream and the title role of Mowgli in Mowgli, The Jungle Book Ballet. He created the role of Kay in the world premiere of Toni Pimble’s, The Snow Queen and the title role in the world premiere of Toni Pimble’s, Peer Gynt.